Lauren Gregg, a Gloucester local and graduate of the Oyster Aquaculture Training program at the Virginia Institute of Marine Science, has been chosen as the Grand Prize winner in VIMS’ annual Marine Science Day artwork contest. Each year, scores of adults and children from the Tidewater area take a swing at designing the piece of art that becomes the official design for VIMS’ biggest public event—Marine Science Day. This year’s theme—the oyster—offered Gregg the opportunity to combine her love of these delectable bivalves with her desire for artistic expression. Gregg’s knowledge and appreciation for oysters stems from the countless hours she spends with them as a hatchery specialist for VIMS’ Aquaculture Breeding and Technology Center. When it was announced that oysters would be the theme for Marine Science Day 2013, Gregg immediately knew she wanted to enter the contest. Gregg decided not to use the oyster’s traditional grey appearance, but to go with two or three colors that were similar to that of the oyster. She then drew the oyster on paper using only a pencil, scanned it into her computer, and traced over the lines using dark shades of blue and black ink. “We always enjoy when people participate in the contest and show their creativity along with their passion for marine life,” says VIMS Outreach Coordinator and contest organizer Susan Maples. “Lauren’s entry stood out because of its simplicity and creativity.” Judging was based on originality, fit with the Marine Science Day theme, and suitability for use on a T-shirt. Gregg’s design will not only appear on the official T-shirt at this year’s event, but it will also appear in publications and advertisements promoting the event. For her efforts, Gregg will receive a framed print of the final artwork, one of the T-shirts printed with her drawing, and a gift certificate to the VIMS gift shop. The gifts will be presented in a brief awards ceremony during Marine Science Day on Saturday, May 18th. 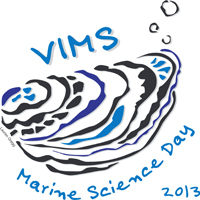 VIMS honors a different animal or environmental feature each year during Marine Science Day. In addition to this year’s choice of an oyster, past selections were a flounder (2012; submitted by Erin Forgit of Williamsburg), seahorse (2011; submitted by Beth Beaubien of Williamsburg), and sand (2010; submitted by Emily Duke). Previous selections, drawn by VIMS staff, were scallops (2009), a sturgeon (2007), plankton (2006), a shark (2005), a sea turtle (2004), and a blue crab (2003). Marine Science Day is VIMS' annual open house, a fun-filled event for the whole family that offers exhibits, children's activities, seining on the York River, lab tours, seafood cooking demonstrations, mini-lectures, and much more. All activities are free, as is parking. The event, which takes place on the VIMS campus in Gloucester Point, proceeds rain or shine. For more information, visit vims.edu/msd.